Beijing, China (AHN) - China's rapidly growing population of Internet users has risen dramatically to about 298 million after surpassing the United States to become the world's largest, said a government-sanctioned research group. According to reports, China's internet use is growing at a rapid rate, with the latest figures representing a 41.9 percent increase over the same period a year ago. I have seen reports that this actually happened a few months ago. 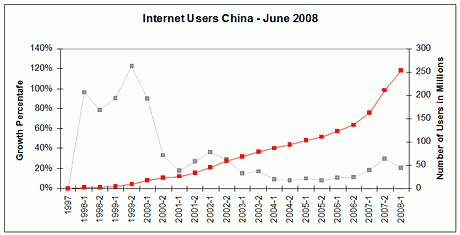 ... but according to recent statistics (June 2008) there are over 250 million internet users in China (and many more elsewhere who also read Chinese) which is more than all of North America. Asia and the Middle East had the highest growth at over 1000%.